Exactly what are they teaching the kids in architecture school today? Well, Friday, May 9th gives you the perfect opportunity to find out, as three major Chicago architecture schools will be showcasing the work of their students on the same day. 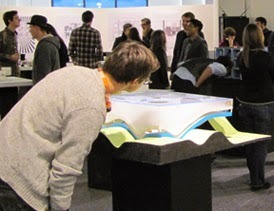 The School of Architecture at the University of Illinois at Chicago will be holding its Year End Show at the galleries of the A and D Studios, 845 West Harrison Street, from 5:00 to 7:30 p.m. while in the building's south lobby, Friday and Saturday are the last days for Myth, the exhibition by Molly Hunker, winner of this year's Douglas A. Garofalo Fellowship. Meanwhile, down at Crown Hall, 3360 South State, IIT's College of Architecture will also have it's annual Student Work Exhibition and Open House, kicking off at 5:00 p.m., with the presentation of the Louis Vuitton SPARK Award chosen from six finalists “from IIT's undergraduate and graduate Cloud Studio program reflecting the College's focus on the City of Chicago and ‘Rethinking the Metropolis.’”. 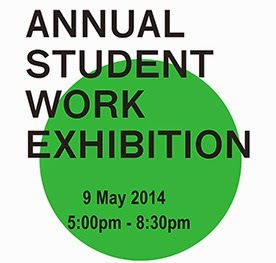 At 5:45 there will be the Spring Student Award Ceremony, followed by the Open House studio exhibition from 6:30 to 8:30.
building), 36th South Wabash, 12th floor, from 6:00 to 9:00 p.m., you can take in SAIC's 2014 Thesis Show: Masters of Architecture and Masters of Architecture with an emphasis in Interior Architecture . . . 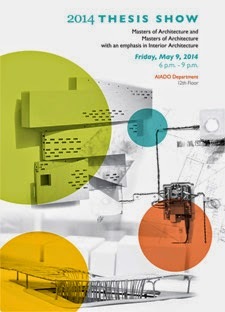 The graduating class of 2014 in the [School of the Art Institute's] newly accredited Master of Architecture program invites you to a year-end exhibition of their thesis work. Please come to meet the graduates, have some refreshments, and celebrate the 5th graduating class of Chicago's 3rd professional architecture program. Make it into a pub crawl, going from show to show and downing a shot every time someone mentions parametricism. After it's over, head down to the Palmer House, up to the Wit, or whatever's chacun à son goût for continuing lubrication and to try start a brawl debating the deficiencies and merits of what you've just seen.